On Wednesday 3th May a visit was made to one of the Dutch isles; Vlieland, where the shooting range of the Royal Netherlands Air Force is situated on the west side of the island. Pilots of fast jets, like the F-16, can practice their skills there with the use of their gun, firing a missile or dopping a (practice) bomb on one of the targets. Helicopter crews can also practice with their gun on the range. Several targets are placed on the range; a few targets to practice the bomb drops and for missile shooting. Some other targets (tanks) are parked on the other side of the tower for gunnery shooting. 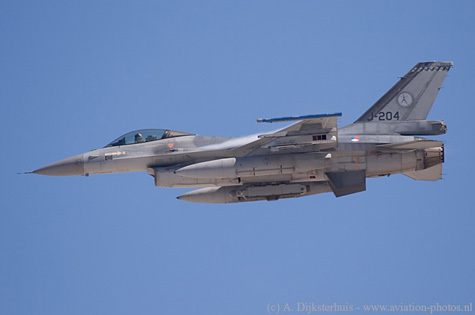 During the visit there were only missions planned with Dutch F-16 from Leeuwarden and Volkel. Unfortunately there weren't any helicopters visiting that day, but it was a great day after all! After dropping several inert practice bombs from a medium-level, the four F-16AMs made several passes in front of the tower. 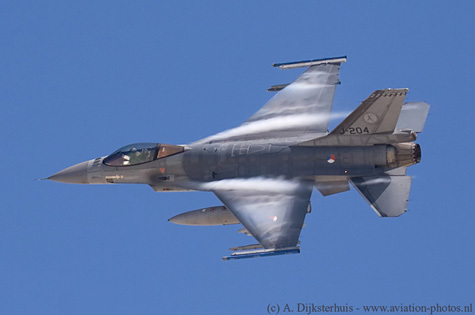 One of them was this F-16AM, with serial J-204, is seen here with a lot of vapor while making a nice banked pass. The same F-16AM is seen here while practicing some low-level strafing. Unfortunately, there were several boats in the danger zone behind the targets which made it impossible to really use the gun. Later on the day, some real medium-level strafing was done by two other F-16AMs. What a sound that is! 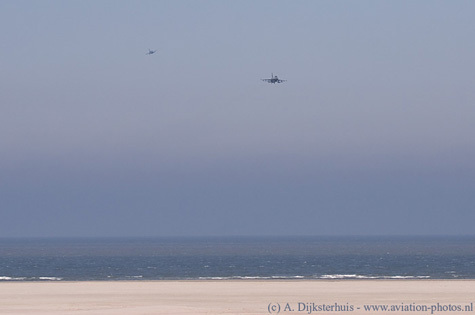 Two F-16BMs made an approach from the North Sea. The J-882 is seen here on the right, with the J-066 just behind him. 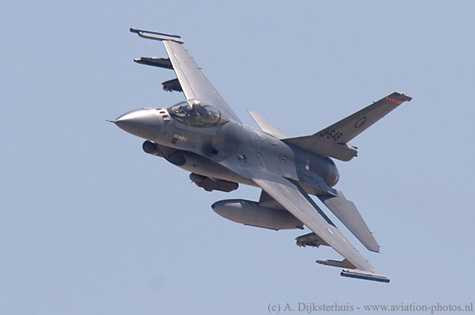 The second one is "Orange Jumper", this is the test aircraft of the Royal Netherlands Air Force Flight Test Unit (Kantoor Testvliegen) which is based at Leeuwarden AB. This is the way we would like to photograph an aircraft in action! The pilot of this F-16AM with serial J-648, knew that apparently and made this shot possible. Special thanks for the hospitality of the Air Force personnel and AGL for arranging this visit.